Mumble 1.3.0, the successor of 1.2.19 is currently in development. 1.3.0 has numerous improvements and new features, and we are currently focusing on stabilizing it for release. You can already try out 1.3.0 by downloading the development snapshots from our homepage. If you are interested, you can see the open issues we want to resolve by priority in our issue tracker (only the highest priorities are must-haves): Blocker Issues, Critical Issues. Feedback encouraged! - We rely on your testing and feedback to improve Mumble, if you find any bugs in the current stable or in a recent snapshot please report them using our bugtracker. If you think we lack an important feature take a look at the corresponding feature tracker. To simplify the administration of servers with a lot of users Mumble 1.3.0 ships with an improved userlist manager in the client. The new manager displays nick, time since the user was last seen* as well as the channel the user was last seen in*. You can sort the display on all those values and apply filtering by username and/or time since the user last joined the server to quickly find the user you want to edit. 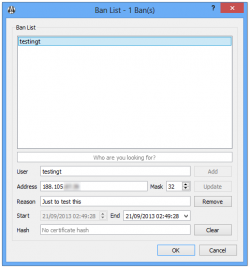 The new interface allows renaming users as well as (batch) deletions. Renaming a user in the user list no longer requires the user to disconnect and reconnect in order to use the new name. With the improved banlist you can add, search, view and edit existing bans much easier than in previous versions of Mumble. An admin can now remove the avatar of a user. 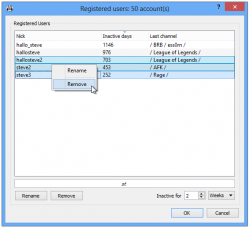 The dynamic channel filtering feature enables you to effectively navigate big mumble servers with lots of users and channels. You can toggle the filter by pressing the filter icon in the icon bar or by pressing [Ctrl+F]. By default the filter will hide all empty channels on the server from your channel tree. Additionally you can right-click channels and add them to your explicit filter list. If the dynamic filter is enabled channels on this list will be hidden even if users are currently residing in them. The Mumble Overlay now displays in more games, for example in Guild Wars 2. New optional toolbar entry to select transmission modes (voice activation, push to talk, continuous). Needs to be activated in Configure -> Settings -> User Interface -> Show transmit mode dropdown in toolbar. This is meant to be used in occasions where the user isn't supposed to change the set list of favourite servers. Both settings can be set through configuration files only (on Linux and Mac OS X), within the Windows registry or in a mumble.ini (see Mumble Portable). 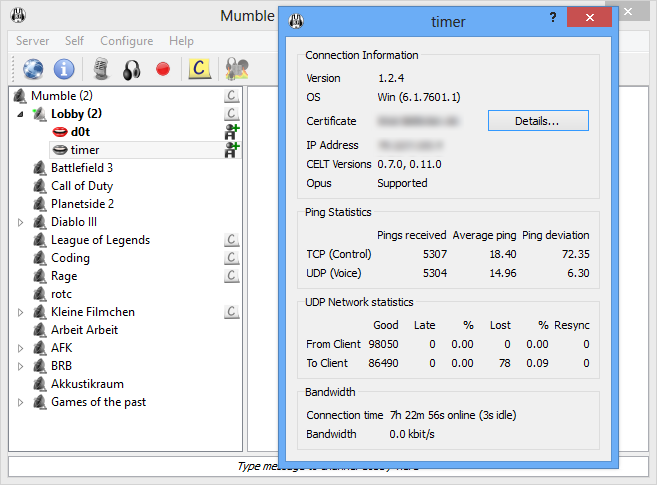 The Mumble client can be controlled through SocketRPC. See here for details. Support for Logitech G-keys has been added. You may need to follow the instructions here. Improvements of the "Priority Speaker"
For a more detailed list of changes already in this release take a look at our github repository. This page was last edited on 30 January 2018, at 16:43.